On the left are two extraordinary rarities based on the Grape and Cable hatpin holder. The first is a truly whimsicial shape made by stretching up the top, then necking it in, spittoon style. Rather than bending the top flames in, they've been flared out. 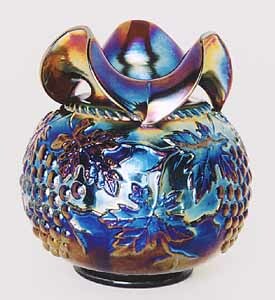 The vase was made from the bottom of the standard hatpin holder but with a different ring cap. There are a couple of these around, including one or two in amethyst/purple--one of these (with a chipped foot) sold in 2008 for $5,500. 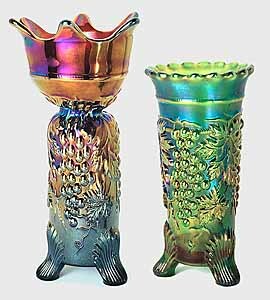 Beware of "vases" that are simply hatpin holders with the top cut off. A purple vase whimsey sold in 2017 for $4,650. On the right is a vase made from the cologne bottle. The neck has been flared and ruffled. I know of no others. It's in the collection of Don and Becky Hamlet.